92.5 Acres of good producing and well-located acreage. It’s an excellent time to invest in agricultural real estate! SOLD!! $170,000 Well-located horse farm on east side of Springfield and just north of I-70. Features 28+ acres, boarding capacity for 60+ horses, and 5-year old modular home. 5 tracts located on quiet road in northern New Jasper Township in Greeneview School District will be sold at auction. Outstanding 71-acre farm selling in 4 tracts with older 2-story brick home on Tract 1. Two fabulous northern Clark County farms with loads of development and agricultural potential. 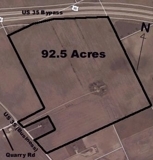 Over 146 acres of good-producing land located in a heavy agricultural area. Excellent swine facility on 33 acres. Also beautiful 1.15-acre wooded building lot and 2-story home on small country lot. Beautiful 6-acre mini-farm located near Cedarville, OH. 2-story frame home with lots of extras. 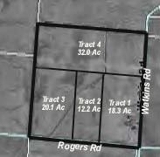 348 Acres (21 tracts of land). With tracts ranging in size from 10 to 54 acres, truly something for everybody - the farmer, the investor, the home builder.